While the cables of a normal PSU aren't that exciting, the cables included with the Sentey GSP1000-SM 1000W unit are pretty nice. 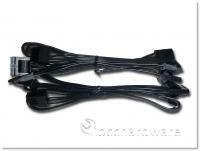 The modular cables are a flat-style cable that adds great flexibility, good looks, great cable management and excellent airflow in your case. 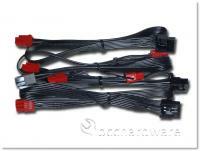 Outside of the standard motherboard cables, there are a total of six PCIe connectors, nine Molex connectors, 10x SATA 5-pin connectors and a single 4-pin floppy connector. This is enough to power most systems for sure. As mentioned previously, the coolest thing with these modular cables is that you can plug them into any socket on the PSU that you like and they just work. Sentey has designed the 8-pin connector to provide different voltages to the lines and bypasses some when they are not required for certain applications. This is really not a complicated idea, but the only company I've seen using this up to this point is NZXT with their HALE90 series. In the past, we've prided ourselves on real-world testing. For graphics cards, CPUs and memory, what matters is what takes place in real applications and games. We also held that philosophy for PSU testing, but after a while, we realized that there is more to a PSU that being able to run a machine stable over a few weeks or months. 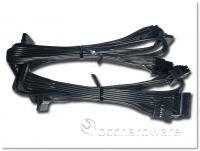 In reality, if there is a lot of ripple, this can damage sensitive traces on your $700 graphics card or $1300 CPU. 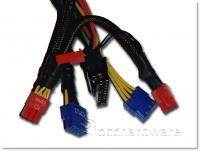 A multi-meter alone is not good enough to check PSU voltage stability. It's for this reason that we've updated our PSU testbed, and will continue to improve the detail and quality of our PSU reviews. That being said, we will still be testing the PSU in a system and will be including stress tests from real components in the real world. We have purchased a Tektronics TDS2002 60MHz Dual Channel scope and it has already become invaluable around the shop here at BCCHardware headquarters. I've used it to troubleshoot everything from PSU's to Radars, and we are using it today to check the stability of the Sentey 1000W PSU on the next page. On the next page we'll pull the PSU apart before we jump into testing on the last page.